There are so many Thai restaurants in Kowloon City (hence its epithet Little Thailand), that it’s a bit pot luck which one you end up at. Faced with so many, you wander around and end up just plumping for one that catches your eye, most of the time. Open Rice is not much help as there are about a gazillion reviews for hundreds of restaurants, and no handful of restaurants stands out. After a couple of disappointments using the zen navigation-technique of choosing restaurants, I finally struck gold in the form of Saeb-E-Hleelub Ped (?!). First off, the restaurant serves Thai sour sausage which immediately puts it in the top 10% of Thai restaurants in Hong Kong. If you’ve never had these slightly fermented, coarse and garlicy pork sausages, trust me, you are missing out. Secondly, all the food we had was really tasty and authentically hot. It’s standard Thai food, nothing fancy, just well executed. A solid menu that’s not too long, but includes all the staples and favourites. What you’d expect in a simple Thai restaurant; lots of juices and sodas on offer plus Thai and international beers. Loved the preserved lemon and honey hot tea that I had, and Mr H had the same but iced. Reasonably quick service, with each dish brought out separately. Very friendly female staff – Canto and Thai – sporting some flamboyant sartorial choices that added a certain panache to the proceedings. Ordering using English was not a problem, and the menus are bilingual. 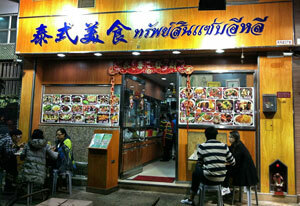 It’s a Hong Kong canteen style restaurant: plastic stools, laminated tables and melamine crockery. Loud and jovial. Mr H and I had four dishes between us with a couple of drinks each. The bill without service came to a ludicrously reasonable HK$222. I’ll happily go back here until I’ve exhausted the menu before going out and searching for an alternative Thai in Kowloon City. Fabulous value, friendly atmosphere and most importantly good food.